A lack of progress in tackling poverty in Wales is of "deep concern", assembly members have warned. Figures are static despite numerous initiatives since 1999 while half of those in poverty are working. Ministers have treated the symptoms, not the causes, and not been innovative enough, the cross-party communities and equality committee said. The Welsh government said it was refreshing its approach to focus "more relentlessly" on the root causes. The proportion of people living in relative poverty in Wales - 23% - is the highest in the UK outside London. It also has the highest percentage of children living in poverty - one in three - of any nation in the UK. Figures show relative poverty - which is calculated as households earning 60% of average income - has seen little change in Wales in nearly 20 years. But the proportion of people in other parts of the UK with relatively high poverty, like the north east of England, have fallen. There has been a long-standing commitment to eradicate child poverty by 2020; in March, the minister said progress was being made despite the figures being "stubbornly high". 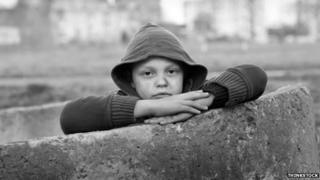 The Institute for Fiscal Studies (IFS) forecasts that child poverty in Wales could increase by about a third by 2020. A lack of understanding about poverty, coupled with "inconsistent implementation" of policies and programmes have been blamed for the lack of progress in Wales. Despite an action plan to tackle poverty since 2012, the report questions whether the measures have made a difference. It calls for ministers to work in a Welsh poverty reduction alliance across business, councils and the voluntary sector. Dr Sarah Lloyd-Jones, director of the Cardiff-based education charity People and Work Unit, said the key was a link with an economic development policy which got people into properly paid work - while there was a "glass ceiling" for poor communities. "We have an approach that says we'll look at basic skills and structures to help people survive in poverty but we need to be more ambitious," she said. "The economy is going to need those people and we shouldn't be in a situation, which we currently are, where engineering firms are going to Poland to bring engineers to work in the valleys because there aren't people trained up locally. " Barnado's Cymru called the report "a distress flare" for the one in three children in Wales living in poverty. "Child poverty is a disgrace and a ball and chain around our future economic development," said director Yvonne Rodgers. Reducing poverty has always been at the heart of Welsh government policy, but little has changed since devolution. One in five people in Wales are living in poverty and that is despite numerous initiatives from Communities First and Flying Start to supporting credit unions and health initiatives designed to help people. The National Assembly report into poverty in Wales highlights half of those in poverty are working, underlining the argument poverty is about more than being unemployed. The report says there needs to be a more sophisticated definition of poverty than just income. But, importantly, it says Wales lacks a clear economic policy to develop more better paid jobs. Tackling poverty - Glyncoch's remedy. The Welsh government said improving the lives of people in poverty was "at the very heart" of what it was doing, with £323m committed in this year alone. Communities First had supported more than 1,700 over-25s into work and helped more than 6,500 children improve their academic performance in the last nine months of 2014. "All government departments have been working together to identify ways we can do yet more to give children the best possible start in life, help people to secure a job and improve their health and wellbeing," said a spokesman. "Meanwhile, we continue to do all we can to mitigate the effects of the UK government's welfare reforms and austerity measures, which have had a detrimental impact on people in Wales."